Yoga can help you with many health conditions, including stress, anxiety, and pain. 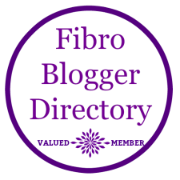 In case your new here to My Inspired Fibro Life, Welcome! You might not know much about me, so let me fill you in. I was diagnosed in 2000 with Fibromyalgia when my youngest child was just barely 2. I suspect I had it much earlier, having shown symptoms in my teens and then treated for Endometriosis in my 20s, 30s, and 40s. My mother was diagnosed with it about 10 years after me. And she suspects her great grandmother had it as well. I tried the drugs and medications early on and found some that helped, but they were later taken off the market or gave me side effects I didn’t care for. So I mainly avoid prescription drugs. Always having been health conscience, I have tried to maintain an exercise regimen and health eating habits to stave off flares and illnesses. As I have aged, I have been able to maintain those healthy practices, but have had to shift my exercise to address other problems that come with age, fibromyalgia, and the like…. Osteoporosis. Lower back disc issues. Hip issues. Sciatica. Neck disc issues (and a fusion). And now shoulder problems. The treadmill warrior gave way to the yogi. You can read my whole blog series about my 30 Day Challenge to a Better, Stronger Me about my yoga conversion here. Yoga can help you with many health conditions, including stress, anxiety, and pain. Here are 11 Health Conditions Doing Yoga Can Help With. Dr. Natalie Nevins, a member of the American Osteopathic Association, often recommends that her patients practice yoga as a healthy prevention strategy. “I focus a lot of my efforts on preventive medicine and practices, and in the body’s ability to heal itself,” she says. “Yoga is a great tool for staying healthy because it is based on similar principles.” She cites its advantages for reducing chronic pain, for lowering blood pressure, and for improved sleeping. To this she adds improved respiration and metabolism, more energy and vitality, weight reduction, and cardio and circulatory health. Read more here. There are likely many local activities going on this month that allow you to try it out. We have local classes each Saturday in the park. Just check your local Events on Facebook for ideas. Your local rec center or yoga studio probably has promotions going on as well. As someone with a already busy schedule, I have always preferred to do my workouts at home at the start of my day. So I follow Yoga with Adriene‘s videos. She has a practice for just about anything that is sore or bothering you. And starting Monday, September 10th, she is doing a new 14 day series called Yoga for All. This is a great way to try it out because she’s making it for everyone. Yoga has honestly helped me be more mindful in my workouts, instead of mindlessly walking on the treadmill while watching TV. While I don’t sweat a lot, I feel my muscles working and getting stronger. I feel a greater sense of peace and focus to start my day. I sometimes incorporate essential oils as well to get some added aromatherapy benefits. Practicing in the comfort of my own home allows me to adjust to the needs of my pain levels that day. I can choose a video for what I need to focus on, rather than having to do what a class instructor already has planned. I don’t feel the need to push myself in front of others, so I can adjust the moves as needed. I would love to hear from you about your yoga experiences, or other gentle ways you help ease your pains! How are you celebrating Yoga and Pain Awareness this month? Leave me a comment and connect with me on social media. I know yoga can help but I can’t get down on floor and have never been able to sit cross legged. Is chair yoga just as good? I’ve been exercising (PT) and it is helping. My knees and low back afflicted with Osteoarthritis. Oh and I have fibromyalgia and some unknown as yet (and hopefully never develops) autoimmune action. I am so sorry! Yes I know all those pains. I have PT exercises I still do daily for shoulder/neck and hip/lower back. I do those first and then my yoga. I’m happy to say that I’ve done my pt exercises for 28 days in a row, and yes I’m counting. I’m almost to the point to add something more. Either bicycle or chair yoga. Thanks. The link doesn’t work. Where in you tube should I search? It’s yoga at your desk by yoga with Adriene. Are you outside the US? Got it. Thx. No, I’m in Texas. In a different view i saw the you Tube. I found it. Thank you very much.